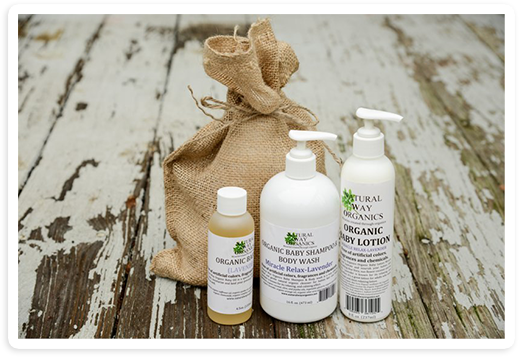 Natural Way Organics is a research company that creates miracles through organics by creating products which are pure natural organic and are at least equal and in most cases stronger than those made with toxic chemicals. We are confident in our products therefore we offer a 100% satisfaction and money back guarantee. Our company is based on the belief that our customers needs are of the utmost importance therefore our entire team is committed to meeting there needs, and as a result we are lucky to have a high percentage of our business from repeat customers and referrals. We would like to welcome the opportunity to earn your trust and deliver you the best products and service in the natural organic industry. If you have little one’s (we love smooshy, cuddly babies!) we carry a full line of organic baby products. From baby powder to soap, shampoo, lotion and our lavender baby oil (one of our bestsellers), you’ll feel comfortable knowing everything’s safe for tender, young skin. Speaking of mopping the floor and shining the windows, we carry several natural cleaning products that won’t require you to open all the windows and wear a pair of yellow scrubbing gloves. Yes, they’re that safe! Whether you’re washing your own hair, or your pets, we have shampoos, conditioners and lotions to give you the soft, squeaky clean skin you desire. Western Soap had its origins in ancient Greece on the Island of Lesbos. There, animal sacrifices were made to the Goddesses. Because the sacrifices were often cremated, hardwood ashes would accumulate (an early source of alkali). These ashes mixed with the tallow of the sacrificed animals. It is said that after a heavy rain a yellow runoff from the fire pit made its way downhill from the temple. The local women washing their clothes in the river noticed that their clothes were cleaner when the river ran yellow. History remembered their poet, Sappho, who wrote of these times and honored her with the definition Saponification – the chemical name for soap making. These are the same women who invented banks. Over time it was learned that adding salt water to the mixture would precipitate the removal of glycerin and excess water, thus making the soap harder, and not subject to the month long curing process required of true handmade soap. This old-fashioned “yellow soap” was used for laundry, dishes, and the occasional bath.In France during the reign of Louis the 14th, bathing was considered an oddity not the norm. It is said that King Louis guillotined 3 soap makers for making soap that irritated his very sensitive royal skin. In desperation the 4 remaining soap makers in Paris got together and invented a method of pouring and curing the soap – taking a month to make a single bar. They saved their own necks, and the world got handmade soap (a.k.a. 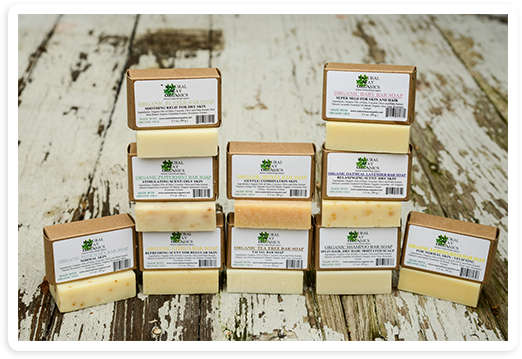 poured soap, cold process soap, farm soap, cured soap).Natural Way Organics is made using a modern version of this three hundred year-old method. Organic oils of Palm, Coconut, Olive and Palm Kernel are blended and mixed at precise temperatures with an alkali solution. (Modern Alkali is made by running electricity through salt water.) The batch is mixed for hours, allowing it to thicken slowly. When it is ready, botanical concentrates and organic herbs, spices and grains are added. The batch is then poured into wooden molds and kept warm for about three days. As the soap solidifies, alkali salts begin to rise to the top like cream. Around the fourth day the soap, now solid in block form, is removed from the molds, skimmed of all alkali salts, and cut into individual bars. The bars are then placed on custom made oak and stainless steel screened drying racks and cured for about three more weeks. This process produces the mildest soap that can be made. Often lasting about twice as long as conventional bars, this soap is extremely moisturizing and soothing to your skin.Various herbal extracts called essential oils are used to enhance and individualize the soaps, as well as to accommodate various skin types. Peppermint , Citrus contain natural astringents making them suitable for skin that is not dry. Lavender relaxes pores making it the perfect soap for normal to dry skin. Add organic oatmeal and you have Oatmeal Lavender, excellent for dry sensitive skin. Our Honey soap is great for combination skin combining the ex foliating benefits of cornmeal with the moisturizing properties of honey and the natural astringent properties found in clove oil. Unscented is a mild and hypoallergenic bar, perfect for the most sensitive of skin types. This bar comes highly recommended from sufferers of dry skin, and Dermatitis.When the crew at Natural Way Organics set out to make a soap that wouldn’t dry the most sensitive of skins, little did they know the journey would take them to the cutting edge of cosmetics chemistry, and hundreds of years into the past!Natural Way Organics bar soap is the first organic bar soap in 200 years to be a true created miracle. Don’t be shy! We love to hear from our site visitors – especially if you have used one of our organic products.Testimonials first thing in the morning puts a spring in our step. You may reach us by email, telephone by going to the Contact Us page.